The trial for Abu-Jamal v. Kane happened on the same day that news of Mumia Abu-Jamal’s health crisis reached his supporters. This post provides a summary of both events, and includes links for further updates on efforts to defend Mumia’s life. The law was passed in response to Mumia Abu-Jamal’s delivery of a pre-recorded commencement speech for students at Goddard College. Leading up to and in the wake of this speech, the Fraternal Order of Police, Governor Corbett, Department of Corrections Secretary John Wetzel, Philadelphia District Attorney Seth Williams, and a number of legislators staged a media campaign designed to whip up a frenzy of support for depriving Abu-Jamal, and any other “offender,” of their constitutional right to free speech. Two weeks after the bill was signed into law by former Governor Corbett, Abolitionist Law Center and co-counsel filed a lawsuit on behalf of Mumia Abu-Jamal, Prison Radio, the Human Rights Coalition, Robert Holbrook, Kerry Marshall, Donnell Palmer, Anthony Chance, and Educators for Mumia Abu-Jamal. The lawsuit is seeking a declaration that the statute is unconstitutional and an injunction against its use by the Attorney General and the District Attorney for Philadelphia. Plaintiffs in Abu-Jamal v. Kane filed a motion for preliminary injunction on the same day the ACLU of Pennsylvania filed Prison Legal News v. Kane, which was also seeking to overturn the law. Both cases were before Chief Judge Conner in late February for a hearing on defendants’ motion to dismiss. Judge Conner dismissed the claims against District Attorney Seth Williams from both lawsuits in a ruling on March 7th based on his explicit disavowal of enforcement, a promise to not bring a lawsuit under the Act, until there is a determination of its constitutionality. The District Attorney was a prominent supporter of the law prior to its passage by the Pennsylvania General Assembly. The judge also ruled that the Plaintiffs in the two cases could proceed to trial on the claims against the Attorney General, and the trial was scheduled for March 30th. The trial on March 30th, approximately 5 months after Corbett signed this ill-fated bill into law, was “on the merits,” meaning that the judge will be making a final ruling on the constitutionality of the Act. 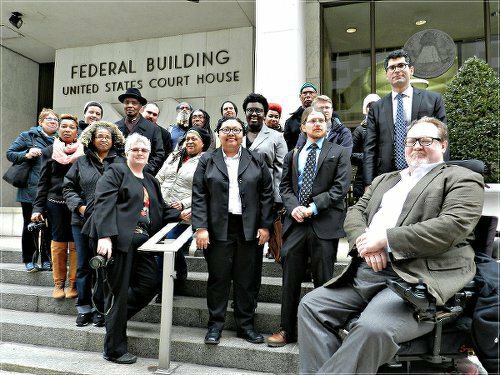 Following the hearing, attorneys for the plaintiffs felt good about their chances for success. “Many court challenges on First Amendment grounds hinge on one basis for finding a law unconstitutional,” said ALC Legal Director Bret Grote. “However, the Silencing Act is plainly a violation of the First Amendment for several reasons, and we think we presented those reasons to the judge well.” We are hopeful that Chief Judge Conner’s ruling will be handed down in the next couple of months. Almost immediately after conclusion of the trial, the positive atmosphere amongst the legal team and supporters was interrupted by the news that Mumia Abu-Jamal had lost consciousness and had been moved from SCI Mahanoy for emergency care at the nearby Schuylkill Medical Center. His blood sugar count was at 779: he was in diabetic shock. His sodium level was 160. Since January, Mumia has been suffering from a severe case of eczema that was reportedly treated with antibiotics and steroids, which caused an allergic reaction. His life threatening medical crisis continues and has now been labeled late-onset diabetes, which should have been identified and treated far earlier than it was. Mumia’s supporters and family members, together with ALC attorneys, rushed to the hospital to intervene on his behalf, but were prevented from speaking with him and were denied any information about his condition for more than 24hrs. The prison did not notify Mumia’s attorneys or family members of his health emergency, and if not for the fact that supporters were at the prison that morning to visit with him, a visit that was denied because he’d been sent to the hospital, it would likely have been days before news of his condition reached his loved ones. The situation bears echos of the recent passing of political prisoner Phil Africa of the MOVE organization, whose condition was not shared with his relatives until the day before his death, the cause of which remains unknown. You can DONATE at this link. His blood sugar registered in the mid 200s today and continues to fluctuate, and although Mumia is still very weak, he was better than on Friday. He told us that the doctors gave him a double shot of insulin right before he came out for the visit, likely in an effort to make him appear temporarily more energetic than he is. This concerns us because insulin overdose is a possibility in these instances. Again Mumia has not yet been seen by a diabetes specialist, although the general practitioner told him today that perhaps he needs to see a nutritionist. This is a sign that our muckraking is working, since the news has gotten around that he was given spaghetti for lunch when his blood sugar registered at 336. However, despite this modest progress Mumia struggled to get out of his wheelchair so that we could take a photo of him. He remained in the wheelchair for the rest of the visit. More updates can be found HERE and HERE. This entry was posted in action alert, alc cases, censorship, mumia abu jamal, prisoner health, Silencing Act and tagged #mumiamustlive by abolitionist. Bookmark the permalink.